Average house prices in England and Wales have almost tripled in the last 15 years, from just over £70,000 in 1999 to about £215,000 in 2014. Apart from a reduction in 2009, at the height of the global financial crisis, house prices increased every year during this period. Behind this average lies considerable regional variation, with average prices in the prime London area of Kensington and Chelsea reaching £1.3 million in 2014. One of the factors that may be behind this increase in house prices is demand by foreign investors. In recent research (Sá 2016), I use a new dataset released by the Land Registry, which records all property transactions in England and Wales registered to overseas companies. 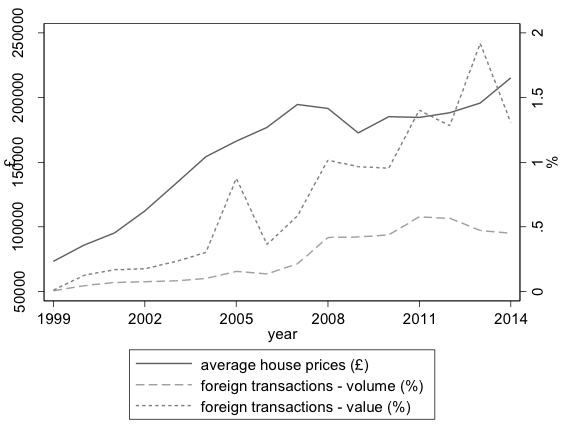 Using these data, I calculate the share of total transactions registered to overseas companies (in volume and in value) and observe that these shares display a similar upward trend to house prices, as shown in Figure 1. As for house prices, foreign investment exhibits considerable regional variation and is concentrated mostly in the South East and major cities in the North, such as Liverpool, Leeds, and Manchester. I use regional variation in house price growth and the share of residential property transactions registered to overseas companies to identify the effect of foreign investment on house prices. To overcome endogeneity in the locational choice of investors, I construct an instrument for foreign investment based on economic shocks abroad. This instrument is based on the analysis of the effect of foreign risk on London house prices in Badarinza and Ramadorai (2016). The instrument relies on two ideas: first, foreign investors are more likely to invest in the UK when their home countries experience negative economic shocks; second, foreign investors tend to invest in local areas where residents from their home countries live. The model is estimated on data for local authorities in England and Wales for the period from 1999 to 2014. I find that an increase of one percentage point in the volume share of residential transactions registered to overseas companies leads to an increase of about 2.1% in house prices. To have a better idea of the magnitude of this effect, I use the model to construct the counterfactual evolution of house prices when the share of foreign investment is set to zero. I find that average house prices in England and Wales in 2014 would have been about 19% lower in the absence of foreign investment (at approximately £174,000, compared with an actual average of about £215,000). Looking at the effect at different points of the distribution of house prices, I find that foreign investment does not just raise prices of expensive homes, but has a ‘trickle down’ effect to less expensive properties. Supply restrictions – due to land scarcity or regulatory constraints – may affect the propagation of foreign investment shocks to house prices. To examine this question, I use data in Hilber and Vermeulen (2015) to calculate the house price-earnings elasticity for each local authority in England. I then divide local authorities into different quartiles of this elasticity and estimate the effect of foreign investment on house price growth separately for each quartile. I find that foreign investment increases prices by more in local authorities with a larger house price-earnings elasticity, which are those with a less elastic housing supply. I also examine the effect of foreign investment on other outcome variables. Looking at the effect on the housing stock, I do not find evidence that an increase in foreign investment leads to an increase in housing construction. I also do not find evidence in favour of ‘buy-to-leave’, that is, the hypothesis that foreign buyers purchase properties purely for capital appreciation and do not occupy them or rent them out. However, I do find evidence that foreign investment reduces home ownership rates, suggesting that some residents may be priced out of the market in areas where foreign investors are more active and have to rent rather than own their homes. These findings are useful to inform the policy debate on the impact of foreign investment on the housing market. This topic has attracted the attention of the Mayor of London, Sadiq Kahn, who has recently launched an inquiry into the consequences of foreign property ownership in the capital (The Guardian 2016). Other countries have also been debating this issue and have introduced policies to control foreign investment in the housing market in an attempt to reduce house price appreciation. For example, Australia has a legislative framework which encourages foreign investment in new residential projects, but imposes tighter controls on the purchase of existing dwellings; Switzerland has quotas on the number of residential properties that can be sold to foreigners; and the Canadian city of Vancouver has recently introduced a 15% property tax on foreign home buyers. Understanding the effect of foreign investment on the housing market is essential for assessing the usefulness of these policy interventions. Badarinza. C and T Ramadorai (2016) “Home away from home? Foreign demand and London house prices”, available here. Guardian (2016) “London mayor launches unprecedented inquiry into foreign property ownership”, 30 September. Hilber, C A L and W Vermeulen (2015) “The impact of supply constraints on house prices in England”, The Economic Journal, 126(591): 358–405. Sá, F (2016) “The effect of foreign investors on local housing markets: Evidence from the UK”, CEPR Discussion Paper No. 11658.